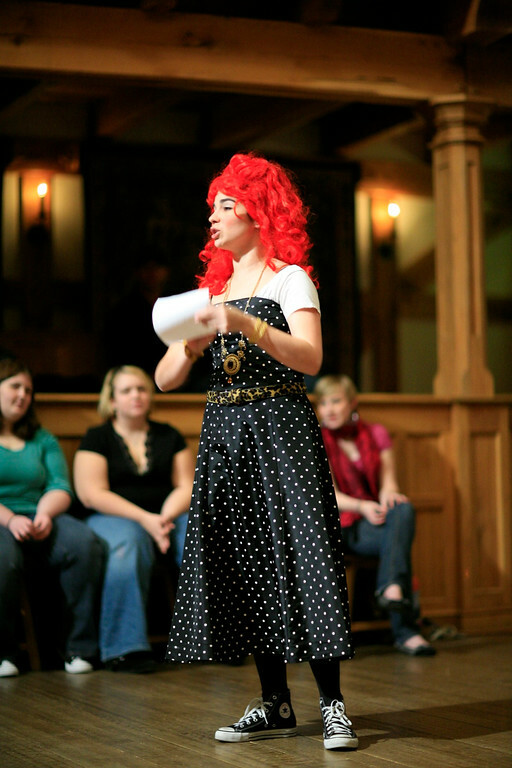 Joan Sacco in VOLPONE. Photo by TOMMY THOMPSON. 2008. 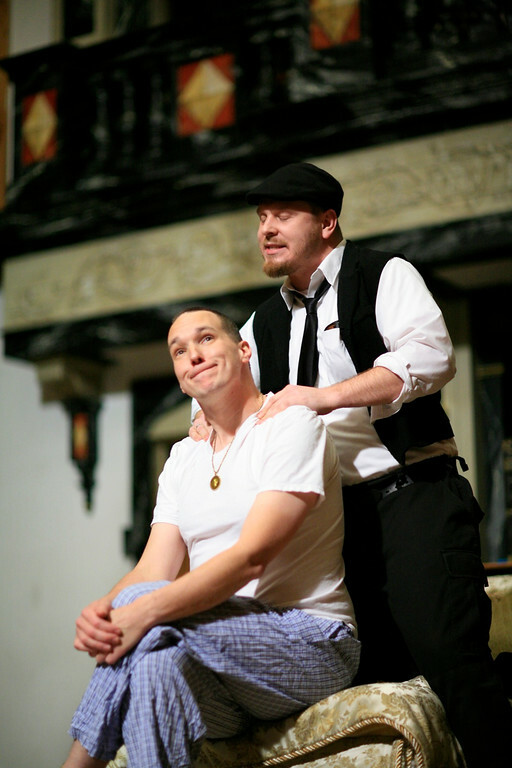 John Harrell and Benjamin Curns in VOLPONE. Photo by TOMMY THOMPSON. 2008. 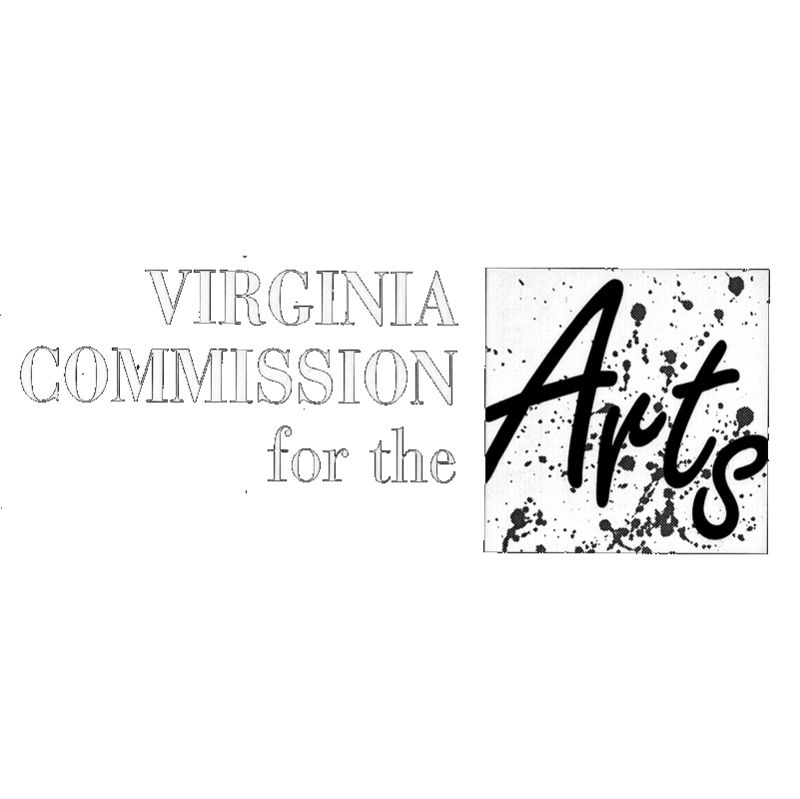 Rick Blunt and Joan Sacco in VOLPONE. Photo by TOMMY THOMPSON. 2008. 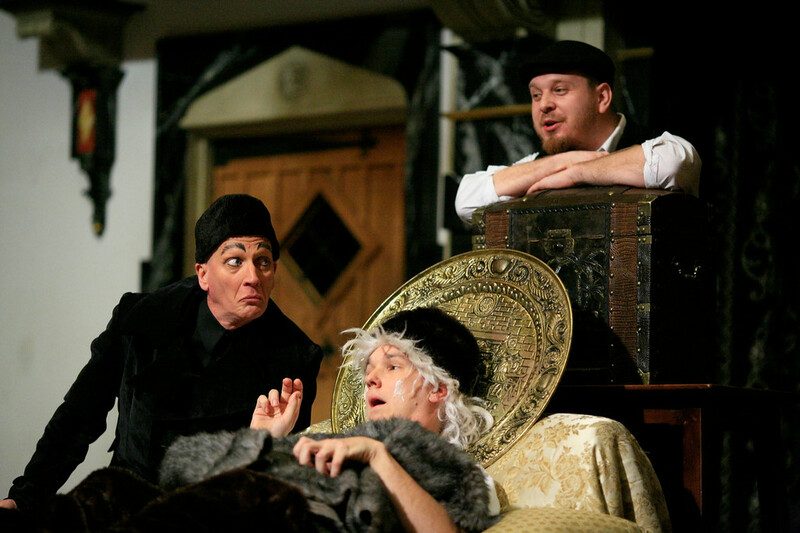 David Loar, John Harrell, and Benjamin Curns in VOLPONE. Photo by TOMMY THOMPSON. 2008. 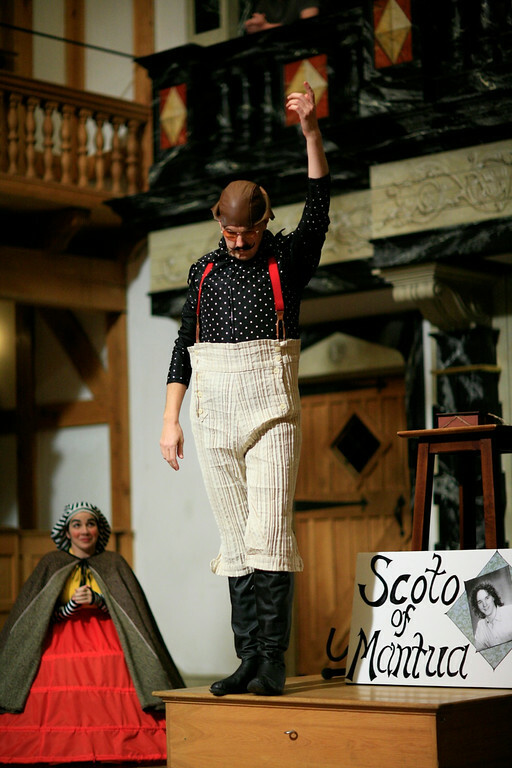 Joan Sacco and John Harrell in VOLPONE. Photo by TOMMY THOMPSON. 2008. 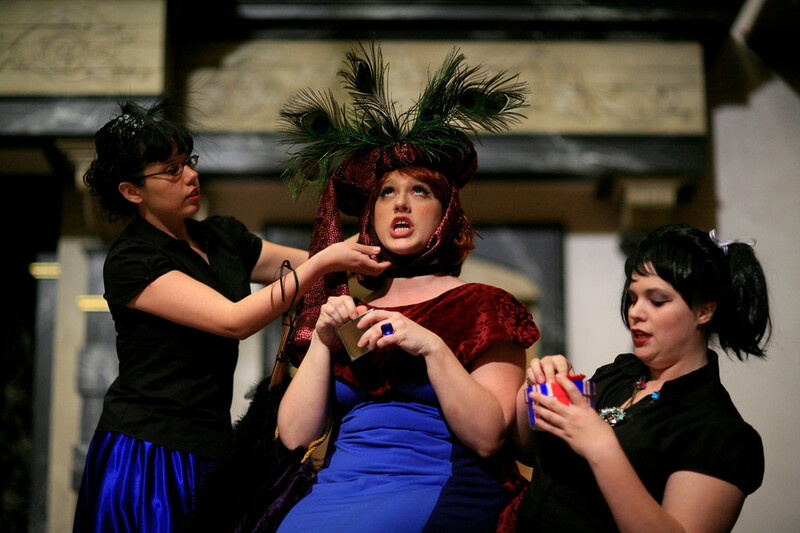 Anna Gonzalez, Allison Glenzer, and Sara Landis in VOLPONE. Photo by TOMMY THOMPSON. 2008. Alyssa Wilmoth and Tyler Moss in VOLPONE. Photo by TOMMY THOMPSON. 2008. The cast of VOLPONE. Photo by TOMMY THOMPSON. 2008.  O ther cross plots, which ope themselves, are told. E ach tempts the other again, and all are sold. Childless, rich Volpone pretends to be on his deathbed to trick his three avaricious visitors: Voltore, a lawyer; Corbaccio, a rich old man; and Corvino, a merchant. The three vultures foolishly hope to inherit Volpone’s riches. Mosca, Volpone’s man, convinces Corbaccio to disinherit his son, Bonario, and take Volpone as his heir. Volpone and Mosca hatch a plan to woo Corvino’s beautiful wife, Celia. Two Englishmen, Sir Politic Would-be, a knight, and Peregrine, a young traveler, meet and talk about England when Volpone – disguised as a street mountebank – arrives. Volpone convinces Celia, who has been watching from her window, to throw him her handkerchief just as her husband arrives. Corvino flies into a jealous rage and imprisons Celia. Mosca convinces Corvino that the cure for Volpone’s illness is to have a “young woman…Lusty and full of juice…sleep by him” and that, if Corvino offers Celia as the cure, Volpone will make Corvino his heir. Lady Would-be drops in to see Volpone. Mosca hides Bonario in Volpone’s room so he can witness his father sign the papers giving Volpone everything. Celia arrives, and Volpone begins his seduction. Bonario stops Volpone, saves Celia, and wounds Mosca as they escape. Seductions, false accusations, trials, and actual illness ensue. He would be the last to admit it, but when Ben Jonson wrote Volpone in 1606, he was making a “comeback” as a playwright. In 1598, at the age of 25, he had made a big hit with Every Man in his Humour (Shakespeare was in the cast), and that success prompted, in addition to a colossal self-regard, four more plays, all increasingly disliked. By the time King James came to the throne in 1603, Jonson looked like a one-trick pony. His prologues and his poetry blamed everyone but himself for the poor reception of his plays and if not for Volpone he might have given up playwriting altogether and stuck to the masques he was writing with Inigo Jones. But Volpone was a thundering triumph and Jonson’s ego would never again be in danger of deflation. 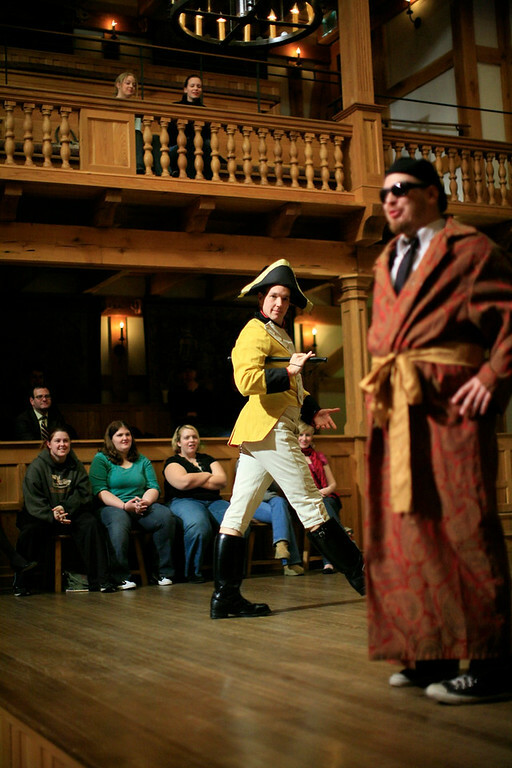 In some ways, no English play is like Volpone. Volpone stands out even from Jonson’s other comedies because of its setting and its tone. 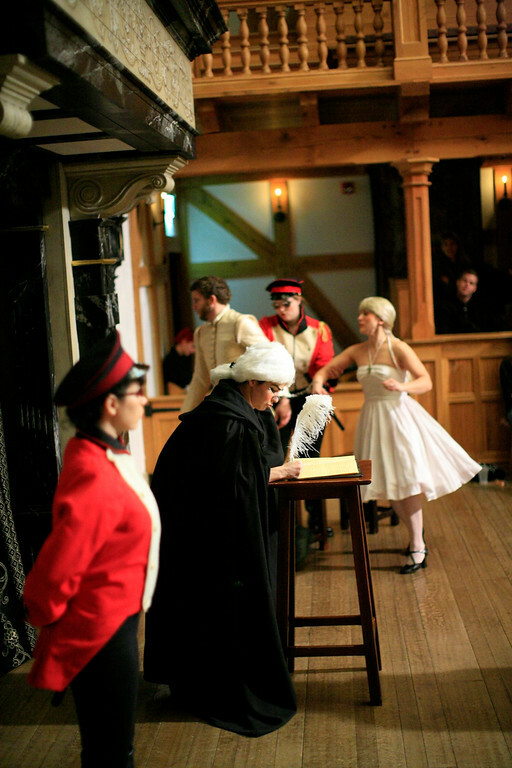 Its stringent regard for the classical tradition that the story should take place in one place and one day is so thorough that the events in the play could have happened in real time. (As Jonson complained, all his fellow playwrights, especially Shakespeare, cared nothing about the Classical “unities.”) And unlike his other mature comedies set in London, Volpone is set in Venice with a scholar’s attention to detail. (Volpone, for example, has 14 specific references to specific places in Venice, Shakespeare’s Merchant of Venice has just one.) Not only did Jonson apparently research the geography of a city he hadn’t seen, he seems to have absorbed into his play Venice’s fabled extravagance and worldliness. The details of Volpone’s wealth, the decadence of his entertainments, and the erudition of his language evoke an almost tangible Venice. The tone, though, is the feature that most separates Volpone from all others on the English stage. 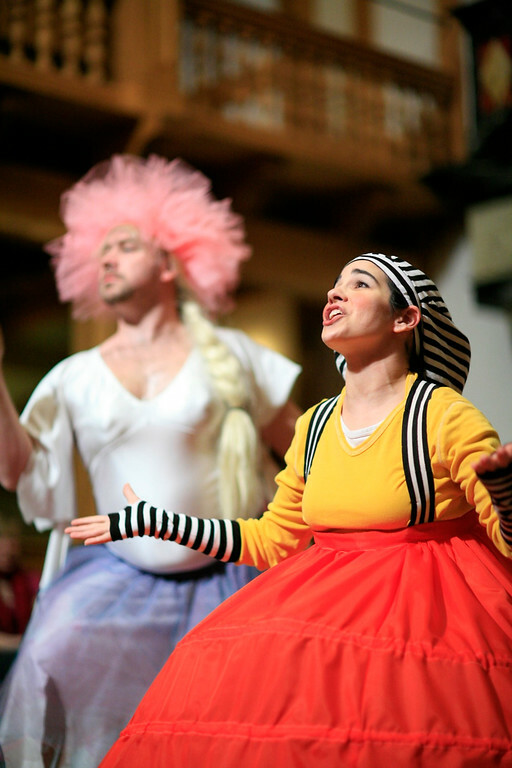 In its comic severity, the rigor of its moral and intellectual world, and its refusal of a “happy ending,” the play resembles Molière’s Misanthrope. Jonson, himself, comments on the work’s dénouement and defends comedies that “are not always joyful.” He knew that in sticking to his principles and his aesthetic he was taking a chance with his already troubled career as a playwright. How gratified, then, he must have been that the play won such applause – both Cambridge and Oxford publicly honored the work – made him the talk of the town, and guaranteed his continued self-regard.